Did a New Jersey couple go on wild gambling sprees, take exotic vacations and buy a new BMW with the money that the public gave to help get a homeless veteran off the streets? This article is about a “feel good story” that has gone really, really bad. Homeless veteran Johnny Bobbitt Jr. served as an ammunition technician in the U.S. Marine Corps. After leaving the Marines, Bobbitt worked as a fireman and a paramedic before eventually falling on hard times. Last October, Bobbitt came across Kate McClure after she had become stranded on the side of I-95 in a bad section of Philadelphia. 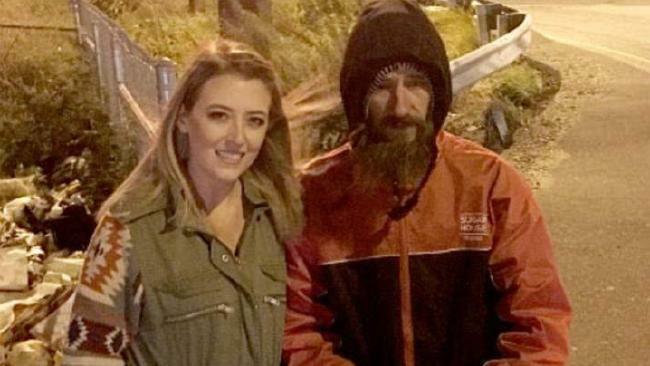 Even though he was living on the streets, he used his last 20 dollars to buy her some gasoline so that she could get home. To thank him, McClure and her boyfriend Mark D’Amico created a GoFundMe campaign to raise money to help Bobbitt get off the streets. The original goal was to raise $10,000, but the story went mega-viral and the campaign ultimately raised a total of $403,000. It was the “feel good story” of the holiday season, and it was covered extensively by the mainstream media. McClure and Bobbitt even made a joint appearance on Good Morning America, and it appeared that this was one news story that truly had a happy ending. McClure and D’Amico never gave Bobbitt the money. Instead, they took charge of it and bought him the things that they thought he “needed”. The relationship between Bobbitt and McClure began to deteriorate when she and her boyfriend bought Bobbitt a camper — they originally promised him a house — and parked it in their driveway in New Jersey, where Bobbitt lived until June, Promislo said. Promislo said the camper was bought with the money from GoFundMe. McClure and D’Amico also bought Bobbitt a truck, which they drove. The truck ended up breaking down. But Bobbitt said he saw troubling signs for the money that thousands had donated to him. McClure is a receptionist for the New Jersey Department of Transportation and D’Amico is a carpenter, according to the Philadelphia Inquirer. But suddenly she had a new BMW, and the couple was taking vacations to Florida and California and Las Vegas, Bobbitt told the Inquirer. He learned of a helicopter ride they took over the Grand Canyon. But now Bobbitt says he’s homeless, hungry and addicted to drugs again. His lawyers say the couple has given him a fraction of the money, CNN reports. And Bobbitt fears he won’t benefit from the rest, according to an interview published by The Philadelphia Inquirer. Bobbitt’s lawyer estimated there should be $300,000 left from the campaign, according to CNN. Chris Fallon said he and another lawyer are working to secure a guardian other than McClure and D’Amico for the balance of the money. Of course there are always two sides to every story, and McClure and D’Amico insist that they have done nothing wrong. McClure and D’Amico tell a different story, saying they are withholding a portion of the money for Bobbitt’s own good. They say his problems with drugs have contributed to him wasting some of the money from the campaign that he was given. And if what they are claiming is true, they may have a point. If Bobbitt is going to spend all of his money on drugs, then he definitely needs someone to watch over it for him. But who is telling the truth? In the end, Bobbitt is in the exact same place in life as he was before all of this money started rolling in. At night, he sleeps under a bridge at the intersection of Callowhill and Second Streets, near an I-95 on-ramp. He spends his days doing exactly what he was doing when McClure’s car stopped in front of him: panhandling. No matter how much money you throw at a problem, nothing is going to be permanently solved unless someone actually wants to change. That is true for individuals, and it is also true for the nation as a whole.